One of the last views of the Susquehanna on a glorious fall morning. From here the Mason-Dixon Trail strikes out cross-country for a westward leg that culminates at the Appalachian Trail. It took me a couple months, hiking an out-and-back piece of trail two or three days a week, but I've now finished the entire 200 miles of the Mason-Dixon Trail. It was a varied experience. Highlights were the White Clay Creek Preserve and State Park in the east and the long section of trail along the Susquehanna River from Perryville, MD to north of Wrightsville, PA. The Susquehanna is the heart of the Mason-Dixon Trail. It was originally envisioned by Bob Yost as a shorter trail, just along the Susquehanna. The connections are vital, though. They make the trail much more relevant. In the east the trail was extended to the Brandywine Trail north of Wilmington, DE, and the western connection is with the famous the Appalachian Trail near Carlisle, PA. AT hikers all see this sign as they follow the white blazes across Whiskey Bottom Road. I clearly remember seeing it on my double thru-hike back in 2012. I knew that my brother lived right beside the M-D T along Christina Creek in Newark, Delaware, but now I knew that it was not just a little 'local yokel' trail. It was part of the grand network of connected INTERSTATE trails that I hope will someday become as vast and robust as the Interstate highway system. The western section of the Mason-Dixon Trail says farewell to the Susquehanna and strikes out westward roughly following Conewago Creek. passing through Gifford Pinchot State Park with an alluring seven mile walk around the south shore of Lake that is the center-piece of the park. But to get to the AT from Pinchot Lake it's all road walking. It wasn't the worst place to road-walk, though. Open farmland give the hiker a first and only look at real mountains along this trail. 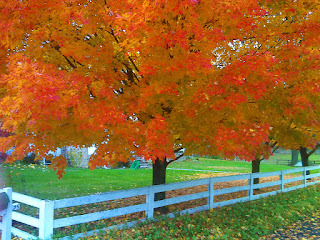 Fall color was also near its ripe and shiny peak. Maples, as always provide the best show. Here are two roadside encounters of particular note. The few sections of off-road footpath that weren't beside the river or Lake Pinchot provided some nice variety. There was this meadow walk through a state game land. And there was this unusual dry creek bed strewn with evenly sized mossy round rocks. On the road walk near Interstate 83 I was greeted one morning by this spectacular sunrise. 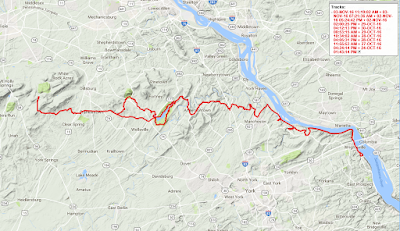 With this trail done, I'm going back to hike the Susquehanna Gorge to hike the eastern side, within view of the Mason-Dixon Trail route, but arguably an even better hiking experience. Watch for the next report. Here is a composite map of the five day hikes it took to complete this segment of trail.